Why Choose Kevin Gourley Photography Workshops? Before I tell you about me, know that really my focus is on YOU and your photography. I want to help you become the photographer you want to be! My classes are always kept to a smaller size to ensure a quality learning experience. Some businesses offer classes with 40 or more students in the class. You'll never find that with my classes and workshops. You'll get way more personal, one-on-one help with my classes. Sure you can watch YouTube videos or other online training, which can sometimes be helpful, but you can't stop the video and ask it a question. And the video can't stop and ask YOU a question to see if you are really understanding what is being presented. True learning often involves interaction. I offer different classes and private instruction that can go at the pace YOU need, to help you really learn. I have been into photography for over 40 years and have taught a wide range of photographers at all skill levels from beginner hobbyist to full time professionals. Also, I have been a full time professional photographer for over a decade with a studio in NW Austin, Texas. I don't just talk about photography. I do it professionally. My experience in helping so many people with so many different brands and types of cameras has helped prepare me to take on challenging photography questions about all kinds of camera gear. I Don't "Speak Down to You"
My students tell me they have encountered far too many photographers who "teach" classes where they felt like the instructor was speaking down to them, where questions were not welcome, and where the instructor didn't respect the fact that students are there because they want to learn. Your learning is Priority 1 for me. No question is "stupid" and you'll always get a respectful answer. Kevin Gourley Photography Workshops are operated by me and my wife Gail. This is not some large impersonal corporation. This is a small business, an independent full time pro photographer, who really cares about each and every client, with a 100% dedicated focus on individual relationships with our students. We are conveniently located just off US Hwy 183 in NW Austin. For many of my classes, I invite my students to come early if they have questions or just need a little additional help. The primary focus is on helping students learn in a safe and encouraging and respectful learning environment. 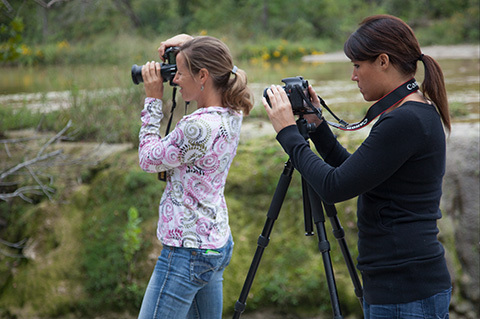 I offer a broad range of classes to help you with various aspects of photography. My destination workshops are the perfect way to put your newly learned skills into practice in some great photography adventures. "Kevin has taught me so much about photography. His classes are both fun and challenging! Kevin goes the extra mile to teach students photography using hands-on techniques. He encourages the class to ask questions and he takes the time to be certain that you understand the answer." "I've taken several intro-level photography classes in the Austin area and while I gained some new knowledge from each class, Kevin is a great "teacher" whereas the others are good presenters. I feel like the class was time and money well spent and am already studying to figure out which class to take next." Click here to read testimonials from my students.